After gross out times with black magic in The Devil (1981), Zhang Ren-Jie returns with The Witch With Flying Head. Previously only available without English subtitles, an old Taiwanese VHS is starting to make the rounds online and hence the opportunity to judge whether varied genre-director Zhang's calling (for two movies anyway) was that of the gory and disgusting. Certainly displaying a childlike (in terms of having fun) dedication to the scenario, The Witch With Flying Head is one of those Taiwanese and cult movies where the descriptions match the content. It may be low budget content but it's on screen nevertheless. While not operating at the same disgusting level as said 1981 movie from Zhang, it's clear this director felt a comfort throwing gooey curses at us and letting the actors deal with it for real so it's no surprise to see a return (and Ma Sha in a cold as ice fashion regurgitate a snake pre-credits). The lure this time is this kind of predicament within a costume movie and concept-wise The Witch With Flying Head sells itself well and maintains momentum despite a less than involving scope as the movie rolls on. It's refreshing to go with focus on the scenario only for sake of coherency. That means Ma Sha is established quick and as quick as he's seen transforming from snake to human form in a puff of smoke, we see Yu Chin's unwilling, nightly rampage as the evil witch. First exhibiting vampire traits but eventually leaving her body with only head and internal organs accompanying her (a wire assisted puppet that is pulled off well and with care considering the budget), Zhang launches at us furiously and seems to speedrun through his movie. 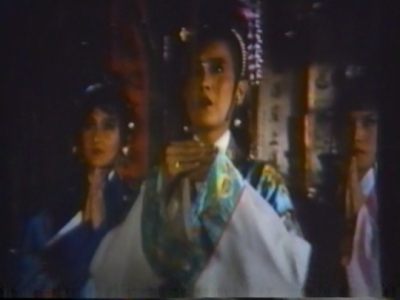 Because we get several nights of flying terror, priests trying to cure Yu Chin, family melodrama (which is not affecting, a go to lazy inclusion but fun to have playing alongside this horror scenario) and we're only at the 30 minute mark. Introducing more inflicted characters and additional evil connected to Ma Sha's sorcerer as well as romance with Lau Seung-Him's character, childbirth and the family peril that goes along with that as the freshly married mother is still the flying witch at certain points, the movie does become a little bit more incoherent and busy for its own good for the next few reels. But it's a drop in quality from really inspiring to rather cool and the inspiring bit is seeing director Zhang Ren-Jie showing dedication to the scenario as well as letting audiences know that means may be limited but as a production we're not going to back down but use our filmmaking minds to accomplish the story and effects. Not as gory as you'd think, it's more a showcase of make-up, physical wire effects, superimposed energy bolts and creepy crawlers inserted every now and then. But having The Witch With Flying Head live up to its rumoured content makes it a delight and further signs of a Taiwanese cinema enjoying playtime to create new, unique visions and visuals for their audiences. But most importantly, someone was having fun.